Almost every automotive GPS navigator will get you from point A to point B as most GPS navigators offer basic functions such as trip routing, lane guidance, spoken turn-by-turn direction and junction views. What sets one navigator apart from another are the differentiating features which can range from detour routing to voice recognition. But there are so many GPS brands out there and so many models in each brand. Where do you start? 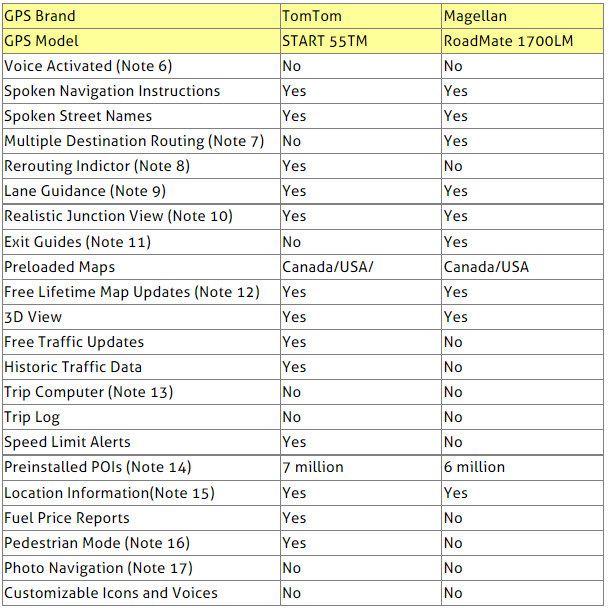 First, note that nowadays two of the leading GPS brands are TomTom and Magellan. 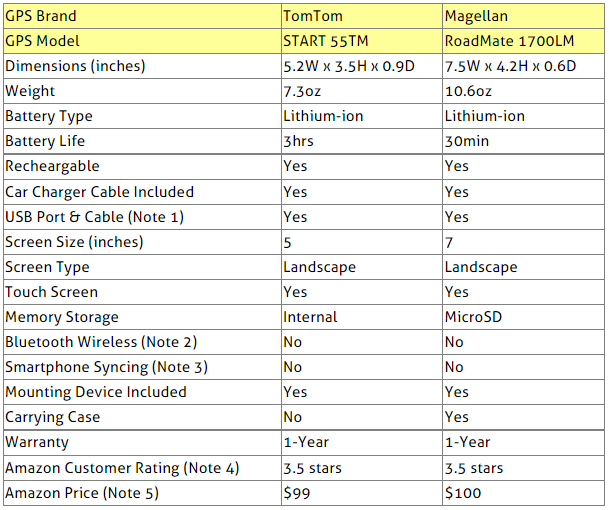 From each of these two brands, we selected for comparison the automotive GPS device that was the best selling model on Amazon at the time this review was written, namely TomTom START 55TM, and Magellan RoadMate 1700LM. 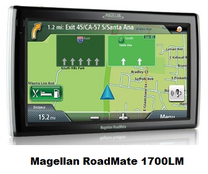 This article will compare the TomTom START 55TM and Magellan RoadMate 1700LM GPS navigation devices. Note 1: The USB port is used to connect to your computer to download maps. The USB cable is provided. Note 2: Bluetooh Wireless support enables communication and syncing of the GPS with your smartphone. Note 3: When your GPS is synced to your smartphone, you can make hands-free calls. The voice data between the GPS and the smartphone is carried using the Bluetooth wireless protocol. Note 4: The Amazon customer rating is the average of all ratings given by Amazon customers who bought the product and reviewed it. The rating is out of 5 stars. Note 5: The Amazon prices can change anytime. Please refer to the Amazon products section below for the exact prices of these GPS units. Note that the Amazon Price usually includes a good discount on the List Price. Note 6: No voice activation is offered. Note 7: This feature allows a you to add multiple stops along a programmed route. Note 8: When the driver misses an exit or a turn, the GPS calculates an alternate route, The TomTom device informs the user about the rerouting on the GPS screen. Note 9: Shows the driver which lane to take prior to an exit or prior to any other move that may require a lane change. Note 10: Realistic display of highway junctions including lane descriptions to help the user make the right move when approaching a junction. Note 11: Display of all available services (gas station, restaurants, hotels, etc.) at the various EXITs of a given highway. Note 12: To get the free maps, you will need to connect the GPS to the your computer via the USB port, log in to the GPS website and download the maps. Note 13: The trip computer records trip data such as mileage, speed, fuel consumption, total time and more. Note 14: POI are points of interest along the route such as restaurants,service stations, historical sites, camping grounds, hotels, etc. Note 15: Provides the driver's current location that may be needed in case of emergency to get help. The location information includes GPS coordinates as well street information. A list of the nearest emergency services such as the police and hospitals may also be provided. Note 16: The pedestrian mode changes the criteria used for route planning (such as avoiding highways and ignoring one-way street signs). It basically calculates the time and route assuming that you are walking rather than driving. Note 17: Many photos nowadays are geotagged, i.e. they have embedded GPS co-ordinates of the place where the picture was taken By transferring the photo to the GPS, this allows to navigate to where the picture was taken. So Which of the Two GPS Navigation Devices to Get? Both GPS navigators will get you where you want as both offer basic functions such as trip routing, lane guidance, spoken navigation instructions, spoken street names, and realistic junction views. In addition, they feature advanced navigation engines with fast and intuitive user interfaces that enhance the speed and accuracy of searches and routing for everyday driving. 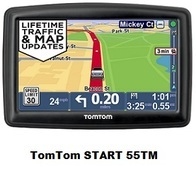 However, if you need to have traffic reports, then you should consider the TomTom START 55TM. You can purchase below on Amazon anyone of the two compared GPS devices. Please click the GPS navigation system of your choice below for exact price information or to purchase. Important Note: Amazon often provides a good discount on the List Price of sold products. The List Price and the actual Amazon price will be shown when you click the images below.